We sell Dried Figs, Sultanas Raisins and Dried Apricots from prestigious Turkish exporters of reliable quality that have improved their quality and security systems with the ISO certification. Although figs are originally composed by 80% of water and 12% of sugar, once dried these proportions vary strongly to less than 20% and more than 48%, respectively. So that, their nutrition facts are sharpened when dried. Dried figs are sold in wooden cases or carton cases, in 5 and 10 Kgs. net weight. There exist different varieties, being the variety Lerida the most popular in the spanish market, with grades ranging from 2 to 8. The grade or calibre measures the number of pieces per kilo; for example, the most requested calibre is 5, which means that there are 56/60 dried figs per kilo. Sultanas are dried raisins of Turkey. These raisins are sold either natural or with some oil coat to get a better free flowing, depending on the final target application. Packaging normally comes in carton cases of 10, 12'5 and 14 Kgs. net weight. In the case of Sultanas, the grading depends on the number of berries and their color. The most valued calibres are standards number 8, 9 and 10, being this last somehow slightly bigger and having a little lighter color. Dried apricots are high in natural fruit sugar and low in Sucrose. They contain higher amounts of calcium, phosphorous and iron than most dried fruits. 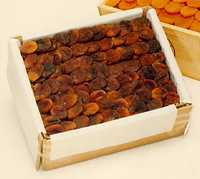 Dried apricots are usually shipped early August, right after being sun-dried. The most demanded type in the market is USA Grade. The calibre standards are numbers 1, 2, 3 and 4, containing 81/100, 101/120, 121/140 and 141/160 units per kilo respectively. Can be packed in 5, 10 and 12'5 Kg. cartons.